Transport Series. This series is our answer to those $4k High End Models that other manufacturers make that everyone drools over, but in reality few can afford. The Transport is available in a 26” Rear Wheel model. The Transport has a little narrower wheel track than our other models 80CM vs 77CM. This gives it a little sportier, responsive feel, and also makes it a little easier to get through a doorway. Along with a powder coated Chro- Moly frame. the Transport Trikes have some exciting features. 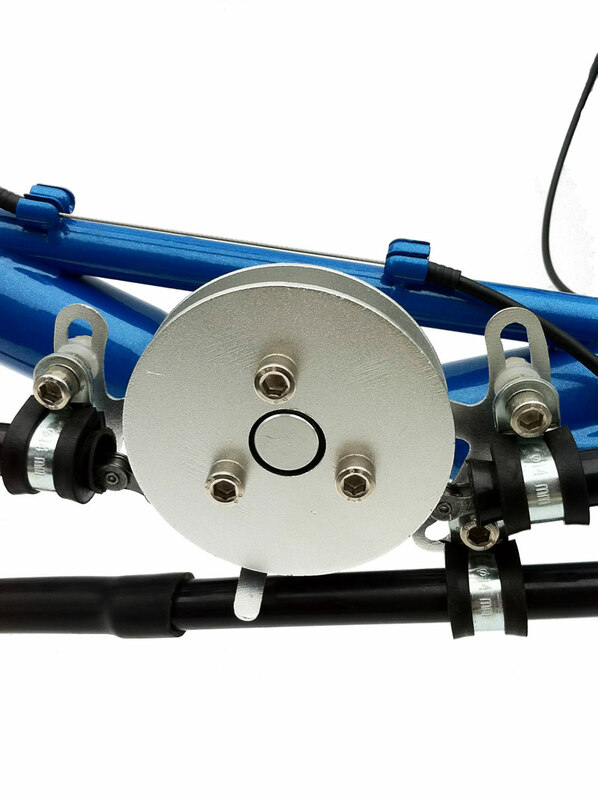 They include a Flat Wheel Fold and Adjustable Quick Release Handlebars. The Transport will come equipped with your choice of a Hardshell Seat including a Ventisit type pad and Neckrest, or a Mesh Seat. Both seats have 4 angle adjustments AND Adjustable seat height with infinite adjustments between 12 5/8″ – 14 9/16″ (320mm-370mm ). X Seam Ranges have also been increased – the Transport will accommodate riders with X Seams from 35 3/8″-47 ¼” (900mm-1200mm ). 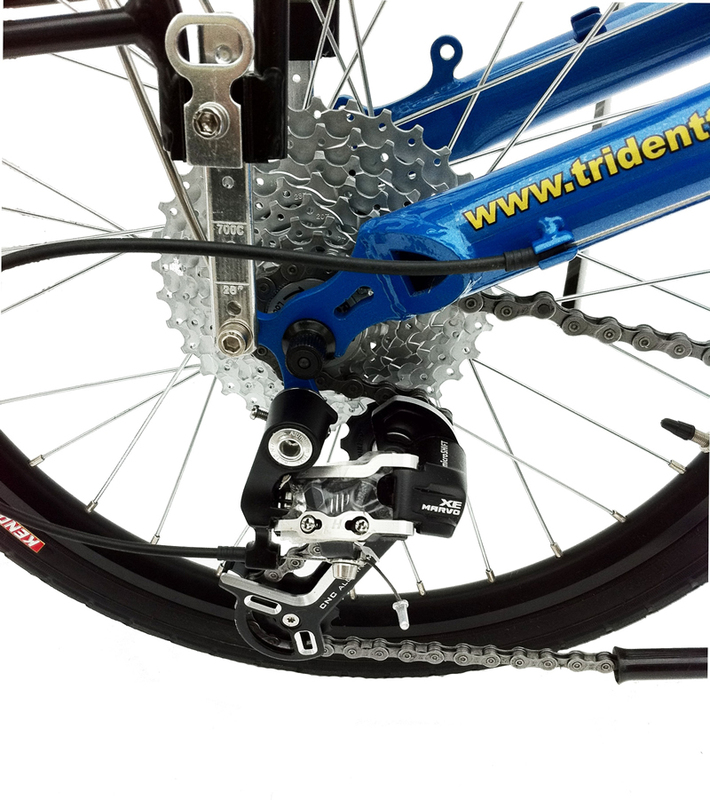 Rounding out the features are Avid BB7 Disc Brakes, a new Idler System which is as nice as anything any manufacturer makes, and finally a CNC Machined Rear Derailleur – the Microshift Marvo XE. 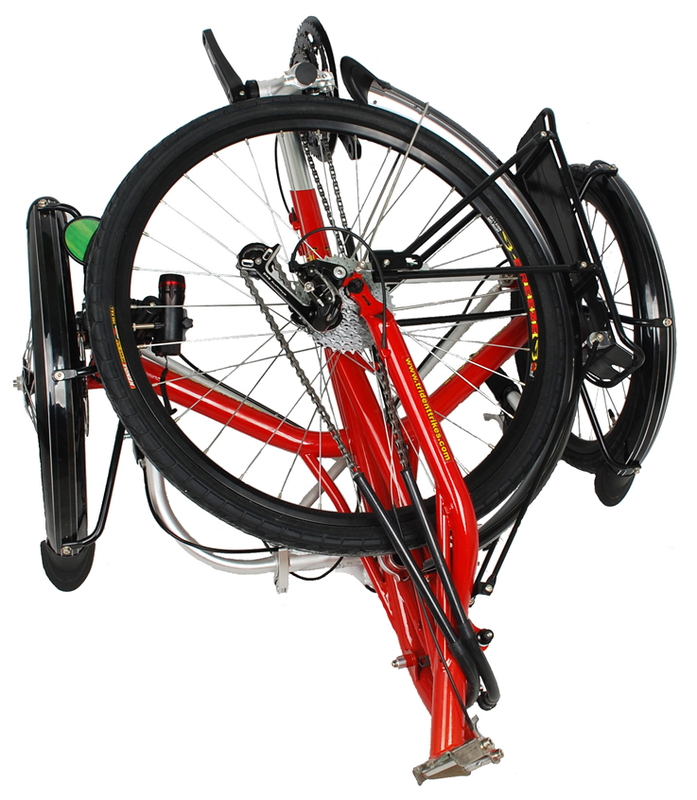 Transport Models have a flat fold rear wheel- please note though that on a Transport 26 the rear wheel is slightly cocked when used with the rear rack. Also on the Transport 26- we don’t charge you for the extras!! Also included with both models are a Rear Rack, a full set of 3 Fenders, a Safety Flag,Brake Levers with Parking Brakes, a Mirror, and Rear Light. Transport Folding Trikes are shipped to you in 1 box it is 95% Assembled- . 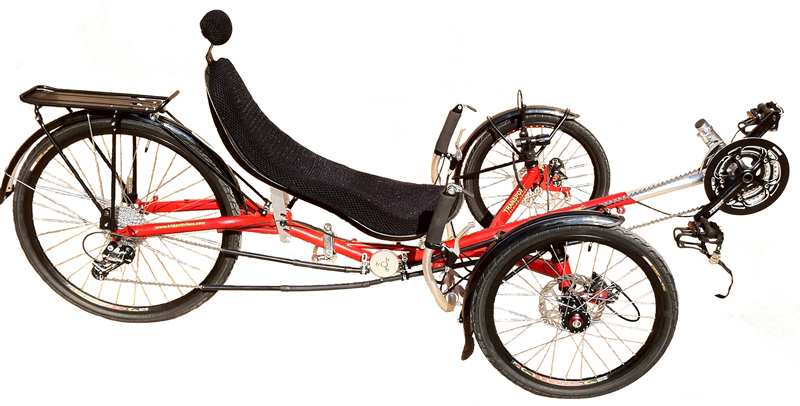 You always have the option of picking up a fully assembled Trike in Lincolnton, NC – about 30 miles NW of Charlotte, NC. However be aware if you choose this option, I will have to charge you 6.75% NC Sales Tax. Shipping added to total price in cart. For shipping quotes to AK, HI, and outside the US, please give us a call. The Transport is 95% assembled (in 1 Box). Click Here for Manual, Warranty, Liability, Return Policy and Privacy info.